How Do You Eat Mochi Ice Cream? Everyone has their own way of doing things, like eating. Some eat fast, while others eat slowly. Some like blending flavors, while others like keeping them separate. Just like eating food, Mochi Ice Cream can be eaten in many different ways. Mochi Ice Cream is all about the experience. So experiment and have fun finding your favorite way to eat Mochi! Take a look below at a few examples of how you can try eating Mochi Ice Cream. A popular way to eat Mochi Ice Cream is by cutting them in half and serving them on a plate like tapas. This makes it easy to bite into and can be finished within just a bite or two. 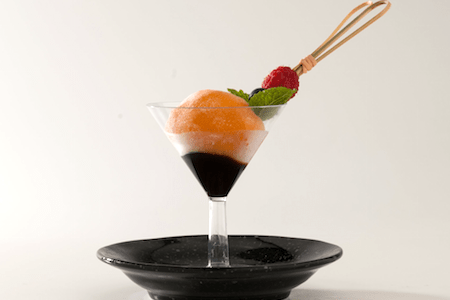 Serving Mochi Ice Cream tapas at a party or event is always a hit, as they look delicate and intriguing. The pop of colors and mix of flavors gives a fun appeal and fancy appeal. This is the classic way to eat Mochi Ice Cream. The outer rice flour dough makes it easy to hold and it’s small enough to eat in just a few bites. When you don’t have time to sit down and are running out the door, it makes it convenient to just grab one and eat it on the go. You can also bring a box down to the beach or to the park and share with your friends and family. No bowl or spoon required! Like milkshakes? Use Mochi Ice Cream to make a brand new kind of ice cream shake! The texture from the rice flour will add a unique consistency, and the ice cream will give it a lot of flavor. There are many Mochi Ice Cream flavors so you can stick to your favorite or mix and match. Use a base of milk (any kind you like) in a blender, add a couple of Mochi Ice Cream balls and any type of toppings that you prefer such as cookies, brownies, sprinkles, whip cream, etc. Then blend until smooth and serve. Now you’ve got yourself a yummy Mochi Ice Cream Shake. Sometimes ice cream is better with a cookie. If you’re craving a cookie too, then try cutting your Mochi Ice Cream in have and then sticking one or two (depending on how big your cookie is) between two cookies and press together. The fun part of creating your own ice cream cookie sandwich is that you can mix and match flavors! Try chocolate, vanilla, cookies and cream, strawberry or even green tea in your cookies. You can even try different types of cookies such as regular chocolate chip, double chocolate chip, macadamia nut, oatmeal and raisin, or even a snickerdoodle! Get creative and make it fun. If you like drinking your desserts, try adding some Mochi Ice Cream to your soda. All you need to do is cut the Mochi in half and then stick a couple in your drink to create a float.